In addition to rotating 360 degrees, ROMASTOR-TILT tilts plasterboard, drywall, solar panels and other materials up to 70 degrees. 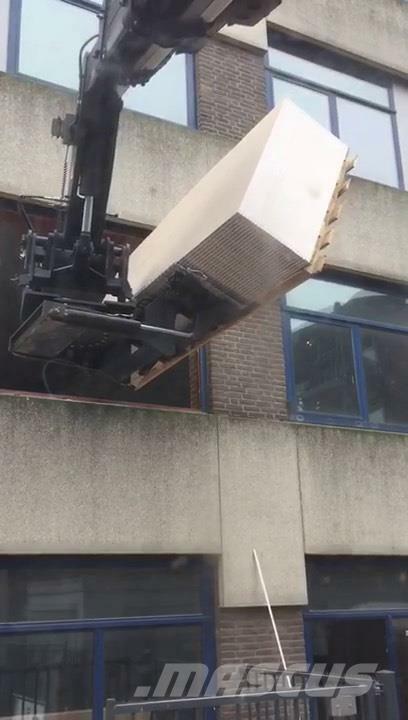 You can now easily lift a full pallet of drywall, straight into a window! ROMASTOR moves pallets and materials in all directions. Since the fork carriage can be rotated 90 degrees sideways, moving long objects becomes child's play, even in limited spaces. Best of all, suitable for all brands of tele-handlers! The rotating fork carriage ROMASTOR is an attachment with great added value for your tele-handler. It significantly increases efficiency and flexibility, while reducing both working times up to 30% and fuel costs up to 20%! ROMASTOR is patented, CE-certified, TÜV type approved, homologated and comes with a declaration of conformity in accordance Annex 2 of the Machinery Directive (98/37/EC), user manual, test certificate, lifting capacity chart and 2-year limited manufacturer's warranty.